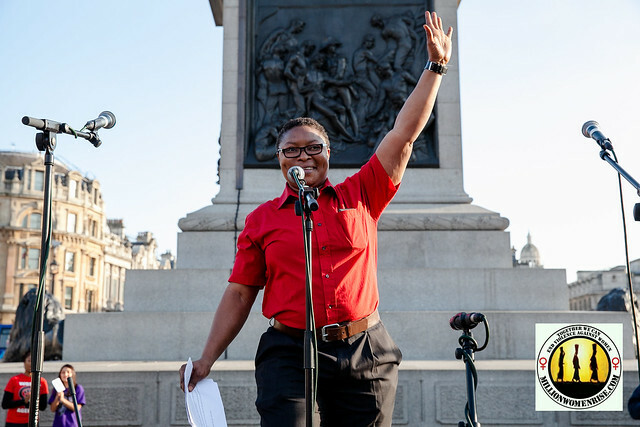 The United Kingdom tried to crush Nigerian lesbian, feminist, asylum seeker Aderonke Apata. Big mistake. They threw her into Yarl’s Wood, the notorious prison for women asylum seekers and migrants. She organized and mobilized. They tried to cast doubt on her claim of being a lesbian. She looked at them with pity, and then provided evidence. They tried to silence her. She founded Manchester Migrant Solidarity, aka MiSol, “a convergence space for migrants (including asylum seekers, economic migrants etc.) and non-migrants, offering practical and social activities for mutual support, empowerment and solidarity.” MiSol joined with WAST, Women Asylum Seekers Together; and Safety4Sisters to make clear there is only way forward: Shut Yarl’s Wood. The State tried to turn Aderonke Apata into a spectacle, then into a cipher, then into a ghost. Each time the State failed, or, better, each time Aderonke Apata succeeded in organizing, mobilizing, articulating, shouting, whispering, speaking, singing, being heard and being fearless. Apata’s asylum case, and status, is still pending. Nevertheless, and because irony is decidedly not dead, Aderonke Apata, this past week, made the shortlist for a National Diversity Award, in the Positive LGBT Role Model category. In the eyes of some, Aderonke Apata is a hero, and the State is condemned. Awards are nice, acknowledgement of one’s work is great, action is the best. End the United Kingdom’s current witch-hunt against African lesbians, against African women asylum seekers, against African women generally. Shut down Yarl’s Wood. Don’t delay, don’t pretend it’s complicated. It’s not. The “conditions in there are very bad.” Every day Yarl’s Wood is open, women living trauma are forced to engage with their past traumas wrapped into new ones, with the pain intensifying by the second. Every day Yarl’s Wood is open, women who sought help are exploited and then exploited again more intensively. It’s not complicated. Shut down Yarl’s Wood, because it’s bad and wrong, and every day it’s open, we are steeped deeper and deeper into guilt and shame. All of us are. Shut down Yarl’s Wood. Do it today. Wow, this is powerfully written Dan Moshenberg! I applaud you.